Sao Paulo, Brazil - Demonstrators took to the streets of cities across Brazil Saturday, with the largest disturbances taking place Sao Paulo, Brazil's most populace city. The day of protest was called for online by Anonymous Rio who called it Operation Stop the World Cup. Like many events organized through Facebook far fewer people actually took to the streets than indicated they would online. Still thousands including a large militant black bloc engaged with police and destroyed state and corporate property including a police car. 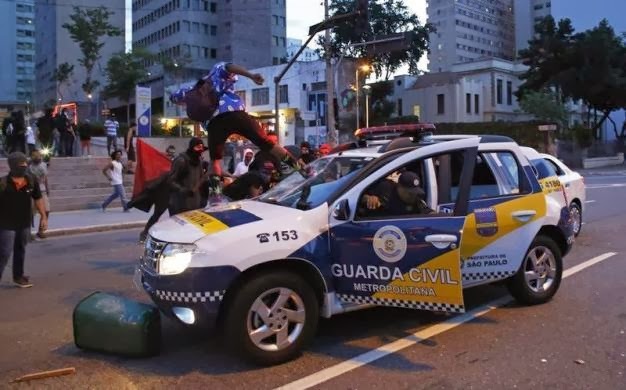 Some media reports have claimed that the police car was unoccupied, but as seen in the picture above at least one officer was inside the vehicle when it was initially attacked. 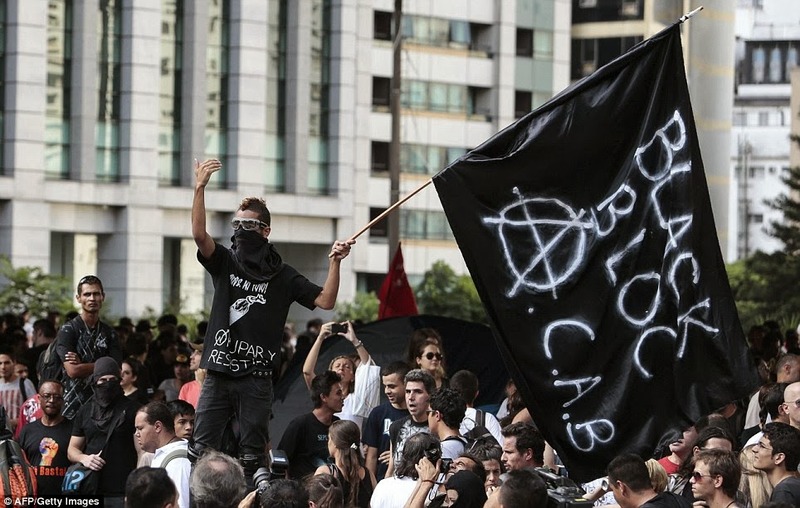 Black blocs and anarchists politics generally have been growing more popular in the country as feelings of general unrest and alienation spread. Support for these tactics and ideas have been increasing since last June when activists took to the streets in opposition to a transit fare increase. The protests forced politicians to back down and rescind on their promises to raise prices on commuters. Since then anarchists have supported and been supported by striking teachers and their union: The State Union of Education Professionals (Sepe). While the media as predictably attempted to portray the militant and confrontation protesters at provocateurs and opportunists, the teachers who marched with the masked anarchists in the streets saw them as allies willing to risk their own safety to support their struggle. Police attacked demonstrators with gas, and small bombs. They also fired rubber bullets and arrested more than 100 people. The FIFA World Cup is scheduled to take place in Brazil in June and is being hosted by the country at an enormous cost to the taxpayers. The fact that politicians have deemed this a necessary expense in a country were so many live in poverty or on the precipice of it has outraged many. While Saturdays actions were relatively small, previous demonstrations saw hundreds of thousands of people shutting down streets, government buildings and partially constructed stadiums. It is near certain that those in power and their security forces will have to contend with more mass protests and destruction between now and June.